The social media updates and news you need to know this week. Changes coming for Facebook, Twitter, Snapchat, LinkedIn, and more! Your Facebook Inbox is now Facebook Messenger: Your inbox on Facebook.com will soon be identical to your inbox on Facebook mobile. The new responsive interface is similar to the web version of Facebook messenger, Messenger.com and can be accessed by clicking the Messenger icon on the right-hand side menu on Facebook. While not everyone has the new version rolled out to them, reports of the new interface are popping up across the U.S. and Europe. Facebook adds Custom Reminders for page admins: If you’re an admin of a Facebook page, soon you will be able to set up reminders to prompt you to update your page. 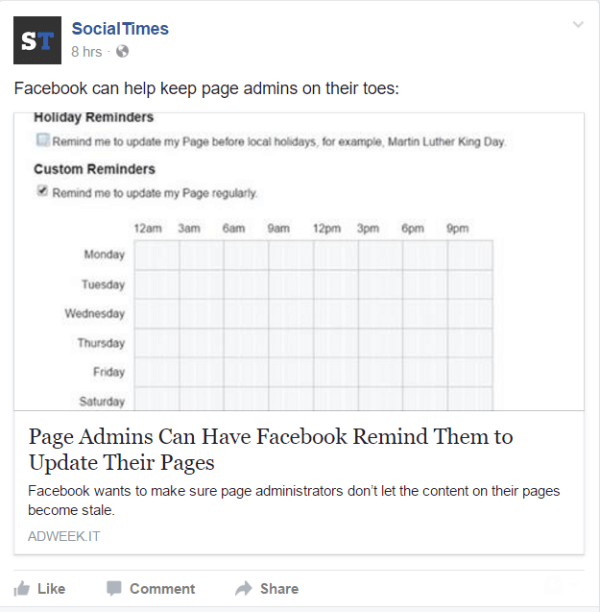 Adweek reports that Facebook is giving page admins the ability to set reminders to update the content on their page. In addition to post reminders, admins can set up custom alerts for specific days and times. There’s also an option to set a reminder to post before significant holidays… kinda like a content calendar. Okay, it’s exactly like a content calendar, but built in. *This feature is not rolled out to everyone yet, so keep checking. Twitter adds video looping feature: Goodbye Vine, hello Vine Camera? Yep. Vine is now just another camera app (because we needed another one of those) and Twitter videos 6.5 seconds or shorter will now automatically loop as Vine videos once did. Have more than 6.5 seconds of awesome to share with your followers? Too bad. BUT, you can automatically crop your longer videos to fit the 6.5-second timeframe. Twitter phasing out the Buy Button: Twitter is saying goodbye to the ‘Buy’ button along with its e-commerce partnerships with retailers and other businesses. The phasing out has been going on since May, but the breakup with retailers will officially occur on February 1st. In a message to its merchants, Shopify states that the decision to phase out the Buy button is a “result of the Twitter team pivoting away from its e-commerce focus. Even though you won’t be able to shop on Twitter..(was anyone doing that anyway? ), Twitter says they will continue to support the Donate button so users can still donate to charities and other causes. Twitter wants you to tweet your new profile pic: Twitter rolled out a new feature that prompts users to send a tweet with an auto-filled #NewProfilePic hashtag when they update their profile photo. So, what’s the point? According to Twitter, this feature should increase the amount of visual content in users’ timelines and encourage more tweets and replies. This update is available to Android users and some iOS users and will roll out to everyone over the next few weeks. Instagram Live Stores busts out of America and rolls into the UK: Americans aren’t the only ones having all the fun on Instagram anymore. Instagram live stories just started rolling out to the UK, Germany, France, Brazil, Canada, and Japan. And don’t forget Canada! Live streaming rolled out to Canadians, too! Snapchat now lets advertisers run sequential video ads: Snapchat wants brands to buy more ads… shocking . For users of the app, this means we will now see longer back-to-back ads within the Discovery section. For advertisers, this means thinking about ads in a different way. Instead of creating one 30-second spot, Snapchat encourages advertisers to create three 10-second “episodes” and tie them together to tell a story. This new advertising package is available to all advertisers, but can only be purchased directly through Snapchat, not via its Ads API and requires early commitments for a full-service execution. According to AdWeek, Snapchat’s sequential ads are initially limited to video ads, but will likely soon involve Snapchat’s recently launched lead-generation tools for deep linking and autofill. Snapchat embraces offline purchase ad targeting: Snapchat’s CEO Evan Spiegel who once called ad targeting “creepy” has joined the ad-tracking party. Snapchat will now show ads based on what its users buy in the real world, thanks to a partnership with Oracle Data Cloud. This type of targeting has been implemented by Social Media giants Facebook and Twitter for some time now and has made them a lot of money, so I guess I see why Snapchat was interested in this…but still… given the nature of this platform, it feels a little too invasive… and that’s coming from a marketer. Just my opinion. Snapchat already lets advertisers target its 150 million daily users based on their behavior in the app, but this is the first time that it’s used a third party to target ads. This update will let advertisers segment users along 100 different customer demographics such as cosmetic shopper, consumer technology enthusiast, or men’s clothing buyer. 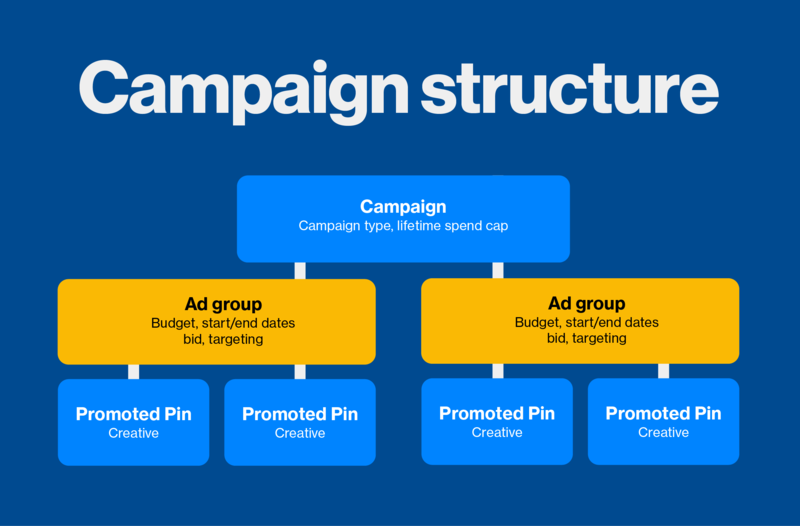 Pinterest now offers ad groups for paid campaigns: Pinterest is stepping up their ad game with new campaign targeting options. The update gives advertisers the ability to assign budgets and targeting to ad groups so that each group can contain multiple Pins. This gives brands better control when testing ad performance against various targets and objectives. Additional targeting options include the ability to set budgets for certain geographic regions, product lines or target audiences. High-Five, Pinterest. LinkedIn redesigns their desktop layout and search feature: LinkedIn officially began rolling out a newly redesigned desktop interface. With the goal of keeping you on the platform longer, the new design incorporates some Facebook-like features, like the new messenger chat windows. Additional updates include a new color palette, an updated main page which functions more like a mobile app with improved navigation, and our favorite update, the universal search bar… finally! LinkedIn launches PYLON for LinkedIn engagement insights: The social data platform DataSift partners with LinkedIn launching PYLON for LinkedIn Engagement Insights. The new reporting API solution lets marketers access LinkedIn data to improve engagement and deliver positive ROI for their content. PYLON will parse the network’s public postings only, not touching anything that people send directly through InMail or any other non-public channel. It will cover things like profiles of “key audiences,” as well as interest trends on the network and how people engage with specific pieces of content. With this new data, marketers can filter the interests and opinions of professionals through a variety of dimensions including industry, seniority, company size, job title, job function and more and use this information to better discover and target audiences, create better content and understand how their brand stacks up against the competition on LinkedIn. YouTube ads can now target users based on Google search: Advertisers can target YouTube video spots based on a user’s Google search history allowing brands to push ads to viewers who recently searched for a particular product, travel destination or movie show time. In addition to this new search data targeting option, YouTube will be rolling out new tools to help marketers measure and understand their campaigns including a new cloud-based measurement with more detailed insights. But don’t worry YouTubers, Google says that they will not be taking away your ability to control which ads you see on the platform, in fact, they are planning to enable cross-screen user controls. Google+ announces platform updates and new features: Soooo…. I guess Google+ is still a thing? Reportedly 1.6 million people are still active on the platform and have asked for some new features to improve their experience. 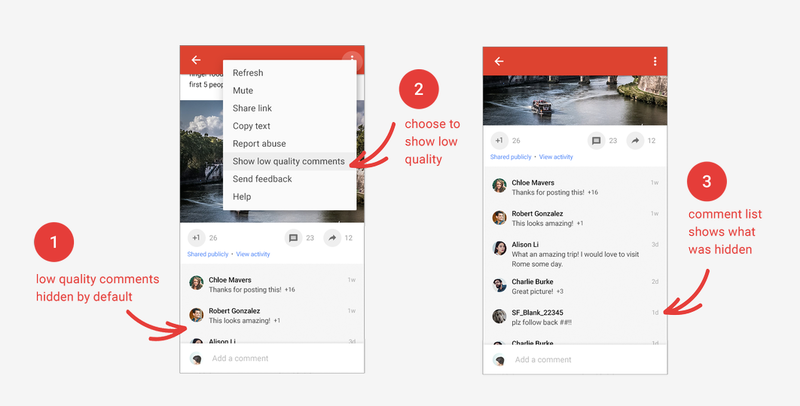 To keep their users coming back to the platform, Google+ rolled out new features including the option to hide “lower quality comments” on posts, photo zooming, and the return of Events. Google also announced that it will retire the “classic” Google+ web interface on January 24 and replace it with the new Google+ layout, which was introduced to the public over a year ago. Vimeo launches video review: Vimeo has just launched Video Review, a feedback workflow tool for its Pro and Business users that allows users and collaborators to give feedback and share their edits with team members and clients using time-coded comments directly within the platform. SLACK: Threaded messaging comes to Slack: Threaded messaging on Slack helps to declutter public channels and make it easier to follow conversations. This new chat feature allows users to easily and efficiently “pop out” of an ongoing chat like they would in channels and direct messages and have conversations in a sidebar. To start a new thread, hover over a Slack message until the context menu appears. (It’s the same menu that you use to add reaction emoji or share a message.) Tap the new chat bubble and a thread will appear in a new pane to the right of the main chat. REDDIT: Reddit embeds native spoiler tags for submissions: Reddit launched spoiler tags for posts so that an original poster can now mark their post as being a spoiler to trigger a clearly identifiable label and pixelate any preview images attached. Other users who “aren’t up-to-date on the latest happenings” can then decide if they want to click and see the hidden preview. Spoiler tags are supported on Reddit’s desktop and mobile sites and in the official Reddit iOS and Android apps. This emoji bug will crash your iPhone: When a white flag emoji, the number zero and a rainbow emoji are sent as a contact, the recipient might find iMessage or the Contacts app is frozen. Netflix plans to significantly boost its original content library in 2017: The shift to digital video continues. Join the mailing list for all our latest offers. © 2019 Be Awesome Digital LLC. All rights reserved.